Having lost his wife in a Borg attack, Benjamin Sisko worked on the ultimately mothballed Defiant project before taking command of Deep Space 9, a former Cardassian space station orbiting Bajor. Although (or maybe "because") it started out as a blatant Babylon 5 knockoff, DS9 eventually became the best Star Trek series, so I'm glad I finally got some Minimates based on it. This Sisko is wearing the "vest" uniform that was introduced in First Contact, then adopted for the shows. The angular neck is squared off, exposing more of the red shirt beneath it. 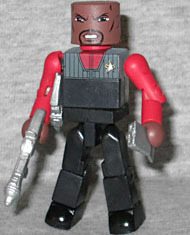 The figure has an extra ring around its neck to suggest the collar, and a very good likeness of an angry Avery Brooks. He's got a tricorder, a phaser that can plug onto his waist, and a phaser rifle. The first time Art Asylum made Trek Minimates, there was a set pairing Sisko and Gul Dukat. That one had a second face printed on the back of his head, showing Dukat's second-in-command, Damar. Sadly, this one does not follow suit: Dukat is all you get. Well, Dukat, and his gold Cardassian rifle and disruptor, the latter of which can fit into the holster on his leg. His boots are just painted on, but his chest cap, sleeves, and the band on his left wrist are new sculpts. By making the sleeves be separate from the shirt, it means he can still move his arms a bit. This entry was posted in Art Asylum, MMMR and tagged Minimates, Star Trek. Bookmark the permalink.